Cook with old-fashioned style directly over a campfire. Camp Chef's durable steel tripod makes open-flame pot cooking nice and simple. 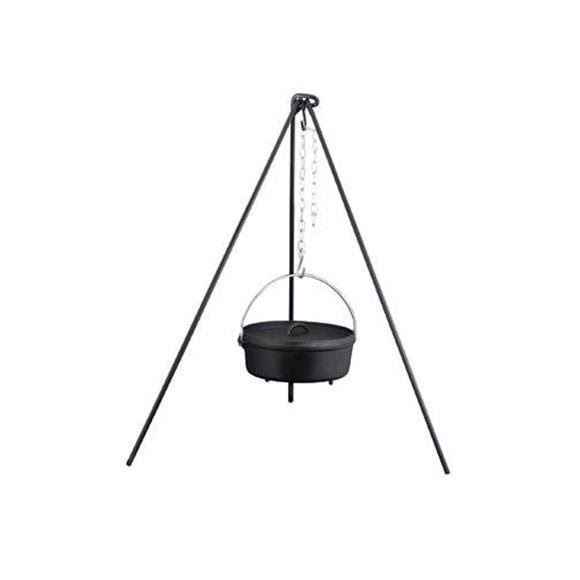 Features include heavy duty iron construction, sturdy adjustable iron chain for hanging cast iron cookware and easy fold up for storage and transportation. Storage bag included. Cook with old-fashioned style directly over a campfire. Camp Chef &apos;s durable steel tripod makes open-flame pot cooking nice and simple. Features include heavy duty iron construction, sturdy adjustable iron chain for hanging cast iron cookware and easy fold up for storage and transportation. Storage bag included.